Question: Can I transfer my prearranged funeral contract if we decide to move? Yes. 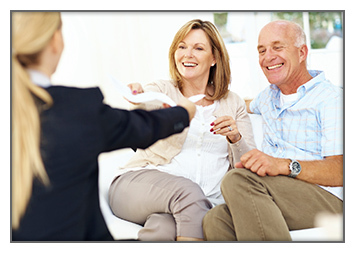 While Johnson Family Funeral is listed as the beneficiary of the prearranged funeral contract, you remain the owner. As owner, the dollar value of the prearranged funeral contract may be applied towards the cost of a funeral anywhere in the country. Question: How do I transfer my prearranged funeral contract to Johnson Family Funeral Home? Simply gather the prearranged contract documents you have in your possession and bring them in with you to Johnson Family Funeral Home to meet with Mike Johnson or one of our funeral directors, or mail a copy of the documents to us, or complete the free consultation form to arrange a meeting with Mike or one of our funeral directors at Johnson Family Funeral Home. If you simply have questions, please feel free to call us at one our locations listed below. Question: How do I Prearrange a Funeral? To prearrange a funeral you meet with Mike Johnson or a Johnson Family Funeral Home representative that helps you plan the services down to the smallest detail. When your consultation is complete, you will have a "Statement Of Funeral Goods And Services" worksheet showing you exactly what that service costs today. There is no charge for this service. Question: How do Prearranging and Prepaying a funeral differ? Prearranging a funeral is an excellent way to make sure that the type of service you want is permanently recorded and gives you an exact cost for that service. This is an excellent way to make sure your family knows your wishes, therefore relieving them of the burden of making hard decisions when the time of need arises. Prepaying a funeral allows you to lock in the cost of the funeral today so that your family will have no financial burden in the future. Question: How do I Prepay a funeral? There are two methods available to pre-pay for a funeral: a regulated funeral trust or a life insurance policy (This is the preferred way). Question: How do I prearrange a funeral if I am receiving Medicaid Assistance? It may be necessary for the prearranged funeral contract to be termed as "irrevocable" if the funeral recipient is applying to or is currently receiving Medicaid assistance. Making the contract irrevocable does not change what or how the Johnson Family Funeral Home will provide the services and merchandise at the time of need. To better serve you, we offer an online pre-planning form.